A 5 mile walk around Shirley which starts at the Methodist Church at the junction of Shirley Road and Wickham Road. This is served by several buses or the route can also be accessed from Lloyd Park (via Coombe Road) or Coombe Lane tramstops. The terrain of Addington Hills and Oaks Lane makes it unsuitable for cycles, wheelchairs, buggies etc. There are several pubs on the route and there is a cafe in Coombe Wood. Shirley Windmill opens for tours on occasional Sundays or by arrangement for groups. There are old cottages at numbers 23-29 and the smithy was adjacent to number 23. The Shirley Village building of 1888 was initially used as a Croydon Library. Shirley Cottage was an early 18th century house converted to flats between the wars. Its coach house formed the front of the Parish Hall to which the main hall was added in 1930. Also on the left is the entrance to Shirley Oaks which began as an orphanage (see plaque). On the right West Way Gardens was the drive to Spring Park and its 18th century thatched lodge remains. The ornamental lodge on this corner marks the route of the drive to the Monks Orchard Estate. Return along Wickham Road to Shirley Library. This was built in an Art Deco style. The village sign outside shows the Shirley Poppy. Go left along Hartland Way and right at West Way Gardens. This gives a closer view of the thatched lodge. The Shirley Inn is mid 19th century. There are old cottages at numbers 55-63. Opposite the bowling green go through the gate on the right into the churchyard. St John's Church built in 1854 to the designs of Sir Gilbert Scott has some fine tombs and monuments. Go around the church, exit via the gate by the lychgate into Shirley Church Road and go right. On the old vicarage there is a plaque to Rev William Wilks who was vicar 1879 - 1912 and was responsible for developing the Shirley Poppy. Adjacent to this house is Hall Grange home for the aged. Continue to the end of Shirley Church Road and cut across the grass left into Upper Shirley Road. On the right is the Shirley Windmill (pictured in header), now amongst modern housing. 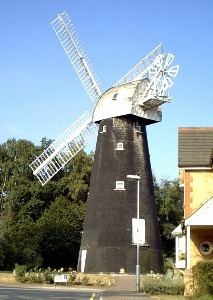 The brick tower mill replaced an earlier post mill which burnt down in 1854. Further along on the right are the Surprise pub, commemorating the rare Camberwell Beauty butterfly and Windmill House (rebuilt in 1983) formerly the coach house to 'the Ferns' (demolished). On the left are a pair of 18th century cottages (numbers 110-112). A short cul-de-sac between numberts 118 & 128 would have led to the smithy and The Old Forge remains at number 120. The post office operated from number 132. The Sandrock pub has sand pits behind. Further along is a house with a bell tower converted from a mission church and school of 1874. Just past this building take the path off to the right and after a short distance the path going down to the right. Follow the roadway at the bottom (noisy dog!). This is Badger's Hole which began as a site for temporary homes of casual workers which have been demolished or rebuilt over time. At the end turn left then follow the London Loop signs to the left. The route goes up through Addington Hills to a viewpoint. A new landmark visable from here is the Wembley Stadium. On the opposite side of the viewpoint go down stony steps. At the bottom go right then left around the hill. When you reach 2 silver birch trunks on the left and a fallen tree root on the right take the path to the right. Continue ahead towards the traffic noise. At the road cross and walk to the left (care at tram crossing ahead). Cross Coombe Lane with care into Conduit Lane opposite and enter the park on the left. Note: the following is a suggested route around the more formal parts but you may wish to explore Coombe Wood further. Past the pond go left through the rock garden which emerges in the rose garden. The pond was dug out in 1845. Many of the rocks in the rock garden are artificial. The roses were donated by Nestle of Croydon in 1971 when a postal strike prevented them being dispatched as a free offer. Go across or around to the exit by the cedars opposite then left along the path in front of the shelter. Go right through the winter garden. To the left is Coombe Wood House built in 1898, now a restaurant. Follow the log-lined path around to the right back to the rose garden gate then take the path to the left. There is a large beech tree on the right. Go to the right by tall pines and walk through the grassed Broad Walk to the right. This is planted with herbaceous plants. At the sundial go left around the terrace gardens down to the main path. To the right the former stables now house the cafe and toilets. Exit the park by the pond, cross back to Oaks Road and beyond the tram route take Oaks Lane to the left. The thatched cottage on the corner was originally transported on wheels from Coulsdon but has since been extended. Further along on the left, past playing fields, is Coombe Farm and beyond it an old chalk quarry. On the left is Oaks Farm, once in the ownership of the Archbishops of Canterbury. The lane crosses Shirley Park Golf Course beyond this. Exit through the gate into Upper Shirley Road and go left back to the start of the walk.